Couscous is a traditional Berber dish of semolina. Recently electedas third favourite food of French people, it can be cooked in a variety of ways and is a great success with adults and children alike. 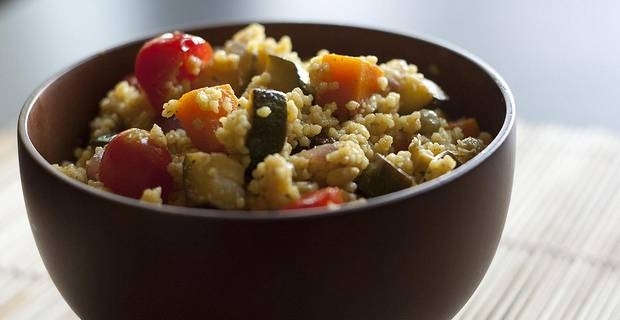 Traditionally couscous is served with meat but here is an all vegan recipe for you to enjoy guilt-free! This is a vegan, non spicy couscous recipe to be enjoyed by all the family. Pre-heat the oven to 200c/gas 6 (for fan ventilated ovens, 180c). Prepare all the vegetable: peppers,halved and de-seeded, chopped up in bite size pieces; butternut squash, diced without peeling; the courgettes and the onion, thickly sliced; the garlic cloves, crushed. Place vegetables and garlic in a baking tray. Top with some oil, mix and place in the oven for 20 minutes. Add onion, cumine and almonds and roast 20 more minutes. Heat up the pre-prepared vegetable stock. Chop up the mint, grate the rim of the lemon for its zest, then squeeze its juice in a cup. In a large bowl, pour first the couscous, then the boiling stock. Cover and set aside for 10 minutes. In another bowl, mix some oil and the lemon zest and juice. Add the garlic, squeezed out of its skin, and the mint, mixing well in a pulp. Then pour in the vegetables and the couscous. Mix well and serve. Being made of semolina, couscous is a valuable carbohydrate food that can replace pasta and rice in any meal. It is versatile and easy to prepera for every taste. in this recipe, the almonds add not only a nutty flavour and crunchy texture, but also their nutritional value, mostly the healthy mono-unsatured fats, vitamins and minerals.